I love beets. I love oranges. I really love Feta. This salad seemed to be an obvious choice! In my version, I roasted the beets with rosemary, sea salt, pepper, and olive oil. I also added a tiny bit of Shallots to the dressing, and used Pino Grigio vinegar. 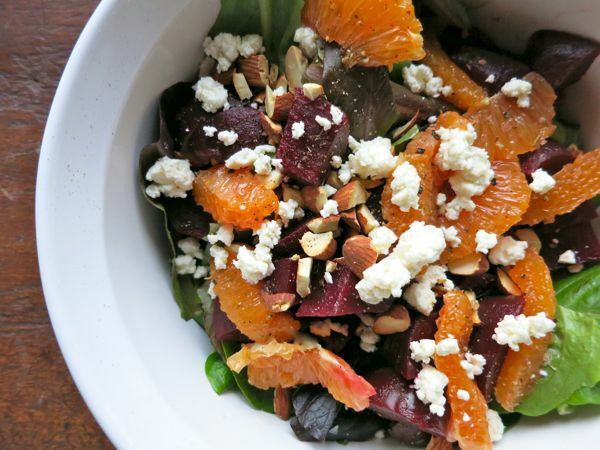 Recipe: Beet Orange and Feta salad with mint from Dinner, A Love story. I originally found the recipe on Pinterest. Beet, Orange, Feta salad with mint from Dinner a Love Story.